Much more important than miles! Hello bloggers! Some of you have already read the blog below. If you haven't, it's a MUST READ. Very important reminder for all of us to seize the moment, enjoy the day, and to cherish our families each and every day. Start here with part 1, and then read parts 2 and 3. I have been reading James's blog for a while now. He is a local runner in our area. Through his blog, I have grown to appreciate his dedication to his training, racing, and diet. Through our blogs, I could tell we shared a passion for all things technical about running, training, and racing. I have seen James occassionally at races, but never had much of an opportunity to talk with him. 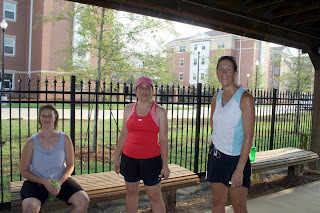 On Sunday, August 22, 2010, a small group of runner's met to run 12 miles on the Longleaf trail. Soon after starting our run, we met up with James on the trail. He turned to run with us. After a couple of miles, the group separated into different paces for the day, and on this day, I was lucky that James was there to run with me. He is MUCH faster than I am, but on this day, he was just "logging some miles", working on building his base. He will be running Rock N Roll Mardi Gras in Feb., and BOSTON next April. Immediately, we were very "chatty" about all things training. My conclusions from reading his blog were "right on." Yes, we do share a passion for training, training hard, and technical running - GOOD STUFF. He paced me through a good run on Sunday, and I enjoyed our chat. Then on Monday, I read his blog and was shocked and amazed at his strength. I already knew from reading his blog that he is STRONG in so many ways. He is an IronMan! I was shocked to realize that I had run with him on such an important day in his life. It was an honor to say the least. Most of the time I consider myself a REALIST (drives my sister nuts). But when it comes to summer running, I go into this fantasy world where I believe if I train hard, I will race well, even in the summer. Prior to the race, my mind was saying 24:30 or faster (DENIAL). 25:01 (BACK TO REALITY). Now I realize why I live most of my life being a realist, and not an optimist. This racing "optimism" or "denial" is tough. :) lol! To be fair, I have had better summers than this year, but it's typical for me to go into summer races thinking this time, I'm ready. Even though I am typically somewhat disappointed with the summer racing results, I am happy that I live in my own little fantasy world, and continue to show up with great expectations. Even though I am not running as I would like to, I am happy to just be able to run each day, and race when I want to. So, what now? I will continue to train hard. I will continue to show up for races, expecting a better time, and better results. I will continue to up my mileage for my fall marathon goal. Yep, summer heat and humidity, you will not break me out of my world of denial, fantasy or optimism. My fantasy world is better than not showing up at all. I would rather run a hard, slow, 5k than to be out of the game. Other notes from today - it was exciting to be around runners who are excited about running and achieving new goals. Renee and Mitzie both ran prs today. So awesome - let me explain this further. Today, the temperature at race time was around 79 degrees with 90% humidity, with a real feel of 92 degrees. These ladies didn't let the heat slow their pace. I am excited for them, and even more excited to see them run this fall. I also met several people who are getting ready to train for their first half or full marathons - very exciting. Vicki and Terry won the 5k today. These 2 runners are always so consistent and impressive. I won the ladies master's award. Masters is such an "old feeling" word, but today I was excited because I won a gift certificate to Conestogo Steak House. I am not a steak eater, but Chad LOVES a slab of red meat, so he will be excited about my win today. Monday evening a friend of mine who is a much faster runner than I am, sent me a text to see if I wanted to join her for some hill work. Of course! How could I pass up the opportunity to run with someone faster than me, and someone who really makes me work hard. So we made our plans for Tues. am. As we were driving to our meeting spot, the rain starts. No worries - no lightning - so we are good to go. We put on our hats and head for the hills. The problem with running with someone who is much faster than you is that you will most likely warm up much too fast. We warmed up for 2 miles at .... well..... basically....at my tempo pace. Yikes! The plan was to w/u for 2 miles, 6 X 800 with 2 min. recovery, on a slightly rolling hills circle, in the Trace subdivision, and 2 miles c/d. ( I was really thankful that the 800 circle was not on the worst of the hills in the Trace) After the FAST (for me) w/u, I was a little nervous about surviving the 800s. As we get ready to start the 800s, I officially let T. know that I will be running my pace and let her know to, of course, run as she needs to .... FAST. She is accustomed to running with slower runners, so it's not an issue. She takes off, and I follow at my pace. You see, not only am I running with someone who is much more talented, but to add to that, I have been running 200s, and 400s on the TRACK. For this workout, not only am I jumping up to 800s, but also moving from the track to the hills. Yes, let me document for the umtenth time, hills - yikes - but this is the type of workout that I NEED the most. I've been working on the 200s/400s because my speed is nonexistent after months of no speed work, and I want to try to run some better 5ks this fall. For me to run faster 5ks, I need the shorter speed work. BUT.....I ALWAYS need hill work. Back to the workout... I averaged 3:52 for the 800s. Fabulous! I forgot my Garmin, so I can't say for sure it was a "true 800", but either way, it was a great workout. I ran hard. I ran with more effort than I would run solo. I always love to have a rabbit out front. Even though I know, I will never catch the rabbit, I continue to try to, not let the distance get too wide between me and the rabbit. And today, my goal was to try not to "BE LAPPED" Success! I was not lapped, T. was only 1 minute ahead of me. lol! When we finished, we started the cool down together, but lemme just say.... I was DONE. Shortly into the cool down, I let T. go, so that I could officially cool down at a responsible pace for me. We both had a GREAT workout, and we were both happy to have company for this tough workout. The best part - we had sprinkling rain during the w/u, and the c/d. Nice! 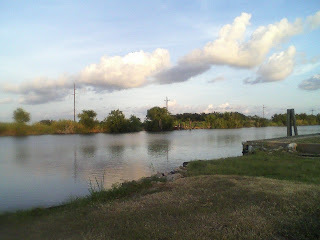 Two-a-day Tues. - Tues. evening we had our second Trek The Trace - 2 mile predicted time run. After the am workout, I wasn't sure what I could do, but I was sure I was NOT "racing" it. I decided to put down the same time that my friend V. put down, and HOPE that I would be able to stay with her. I warmed up for 1 mile - feeling that am workout, for sure. We put down 16:50. Again, let me say, I have no, notta, zero concept of pace without Mr. Garmin. Late into the race, as I am running with V. she asks "do you think we are close?" Ha Ha....I have no idea. We continued on. I was pleasantly surprised because this felt like a tempo run. We are not sure about the time, but supposedly we ran 15:34. V. and I both felt that we may not have run that fast, but if we did....GREAT! I'll take a 15:34 after that am workout any day. Either way, it was another great workout for the day, and it was fun to run the race with V.
Tonight, my hubby joined us and ran the race. He ended up winning the predicted time being off by 1 second. He predicted 11:30, and ran 11:29. Sweet! He won a yoga book for me. He is great at pacing! Two a Day Tues = Success! My friend over a Run 4 It took some pics at the TTT. Check them out. Update - this is what I'm up to! This week will be my 8th week of speed work. Finally feel like I'm making some progress. Not so much in race results yet, but I just feeling like I'm getting in shape. I have also started to make tiny baby steps in getting my winter weight off. Getting closer to my "race weight" which will be timed perfectly for my fall racing plans. Just have to stay super focused on the goal. Aug 7th - Bun Your Buns - 5 mile race - another disappointing race. hills, heat, and humidity were not a winning combo for me, but it was still FUN to participate and to see a lot of runners out, in Aug., for a 5 mile race, with extreme heat. I did win my age group, and a $25.00 gift certificate to Soccer Locker & City Runners. I also sold some DryMax socks after the race, so it was a good day. I ran 42:58 (8:38 pace - hee hee - this is just a little faster than my pr marathon pace). I need to race more often on hills. I train on hills most of the time, but I need much more race experience on the hills. As mentioned before, I have been racing flat and fast courses for about 7 years, trying to pr in all race distances, so I do not have the race strength I need to race effectively on hills. I want to work on that! Aug. 10th - the 1st of 4 Tues. night Trek the Trace - 2 mile predicted time runs. Here's how it works. You write down what you think you can run for 2 miles. Everyone removes all timing devices, and we run the 2 miles. The person who is the closest to their predicted time wins the race. This is fun because this gives everyone the opportunity to win the race. This is not about who is the fastest, it's about pacing. Tues. night Laura won - she predicted her finishing time exactly. Yay Laura! How did I do. Well, as for the prediction - not so good, but the good news - I was on the FAST side of the prediction, and for me, that is always a welcome thing. After the slow 5 mile race, I wasn't sure what to predict, so I predicted 16:30. I finished the race in 15:15 and was really happy with that. This race is FLAT, on the asphalt Longleaf Trace (rails to trails). Finally, seeing a little results from my speed work. Woo Hoo! Aug 12th - met Dawn, Vicki, and Terri to get reacquainted with "Honey Suckle Hill." This is one of those workouts, that you REALLY DO NOT want to do solo. Dawn and I ran this workout a couple of years ago, but for some reason we got away from it. Dawn "called" the workout, and I was excited to join in. Even with the 5:15 am start, this is a workout that I can get excited about because I know "it's a workout that I REALLY need." For our first time back, we were a little conservative on the number of hill repeats, but we have a starting point, and we will build up the number of repeats. 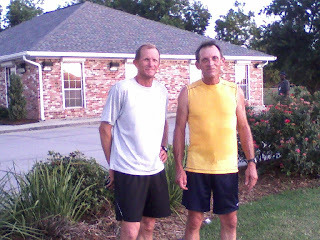 Aug 14th - today I needed to run 12 miles - I wanted to do a few miles with the guys to get a quick start. I met Keith, Toby, Jim F., Phillip, and Chad came along with us. This group is too slow for Chad (my hubby) but I was glad that he joined us. I ran 3 miles with them on the USM campus, @ 8:38 avg. pace. Then I met Dawn, Terri, and Vicki. Vicki was finishing up her mileage, but then Dawn, Terri, and I headed back to the hills. I ran the next 7 miles with them, and then finished up my last 2 miles solo. I was able to pick it up the last 2 miles. Excited that I felt good after the quick start, and was able to finish strong. I averaged 9:26 pace for the 12 miles. I am happy with that. 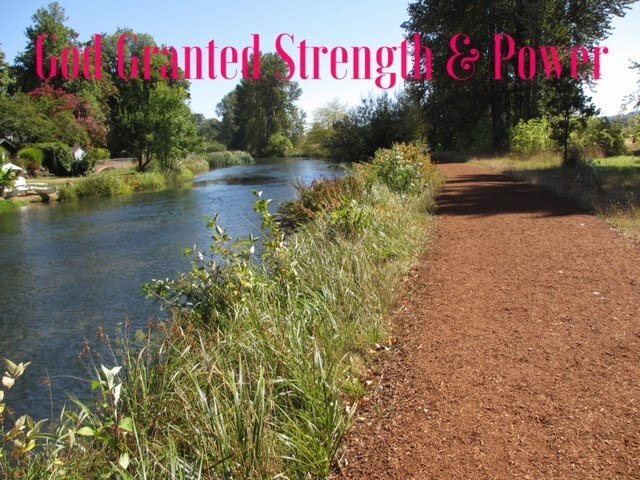 I feel like I am building some strength, and I feel I will be "ready to run" when it cools off some. I am happy to be running this pace in our current heat and humidity. Hope to continue to build on it. Chad & Scott after a recent Golden Meadow, LA bayou run. In the mean time, my goal is mixed. I will continue to work on shorter speed work and 5k racing, but I will be building my long runs, and mileage for the marathon. I have officially decided I will go with a 12 week marathon program from Advanced Marathoning. I will be working toward "maxing-out" with 3 - 70 mile weeks prior to the Rocket City - Huntsville, AL marathon. (my previous high is 63 miles for prior to St. George) Since mid June, my mileage has been 30-40+ miles, except for occasional "step back"weeks. This week, I will finish with 45 miles, after my 4 mile run today. I will continue to gradually move up from here, in the weekly mileage. I feel like I have a great base, and I hope that I can handle the increasing mileage. Currently, I feel strong and ready to go for the mileage goal. I want to see "what will happen" with the increasing mileage. Will it help, will it be more than I can handle, who knows?? ?.....but in the mean time, I will enjoy the journey, and the experiment. This is GREAT! Interested in a Race Challenge? Amanda over a RunToTheFinish has a great challenge for the fall. I signed up for the 5k. I will be dual training - trying to PR in the 5k and training for the Rocket City Marathon. Should be an exciting fall. FUN! Technical Runs - it's like "sight fishing"
Ok ladies, sorry for the fishing analogy, but for my male friends.... A technical run that is planned, implemented, and run "to a T", is like "sight fishing" and catching that redfish when everything went as planned. The other part of the analogy that occured to me on the run today, for me, running a technical runs is what I love to do. Back to the fishermen... once you learn to "sight fish" it's hard to go back to just casting for fish. For me, although, I do some runs of "just running", the technical runs really get me excited about running. Can't run these all of the time, because as you will see later in this post, my brain would explode. 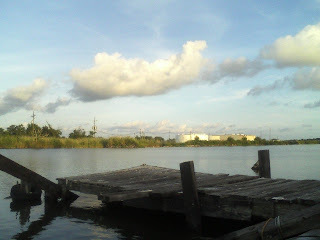 In case you do not know, "sight fishing" is when you look into the water to see the fish. When you see one, you have to plan your cast with the movement of the fish to get the bait in front of the fish, not hit him on the head with the bait, not cast behind him, etc. You have to "present" the bait to him, and if you do it right ( I rarely do), you get to see him attack the bait. This is where your skills continue, because you then have to "set the hook" at just the right time, to be able to "boat the fish." While I am not very good at it, I do enjoy and appreciate the challenge of it. My husband is a fishing guide (www.dufrenesguideservice.com - he can teach you, or it makes an EXCELLENT gift for your hubby for Christmas...just sayin). He learned this technique many years ago, and taught me how to do it. 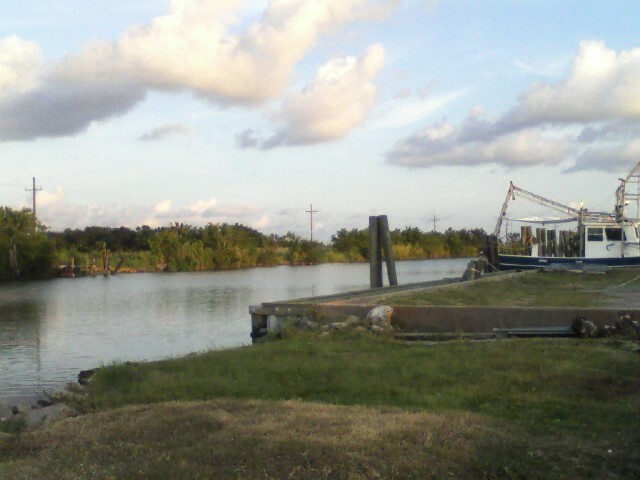 Since learning how to fish this way, I rarely want to go out and just fish. I would rather go out and enjoy the challenge of making all of these things come together. This is the same thing for a technical run. I love to go out with a plan, and I really enjoy the challenge of trying to achieve the goal. Today the plan came together and it made for a great day on the roads. The plan - an 8 mile run with a little progression in pace. 1st 2 miles - just run, but planned around 9:30 pace, but "run by feel" the first 2 miles. 1st 2 miles - mile 1 - 9:13 - thought - are you crazy - you know you can't "run by feel." 2nd thought - that would be a brutal progression run if I pick up the pace from here (started at 7:00am - it's 81 degrees with heat index of 92 degrees in South Louisiana). So mile 2 was a "concentrated" "get on pace" mile. Slowed it down - 9:45, for a perfect 2 mile split - 18:58 - remember the goal was 19:00. Oh how sweet! 2nd 2 miles - 9:26 - ok...need to pick it up just a little - 9:22 - ok, a little over the goal, but in the ballpark. 3rd 2 miles - 9:10 and 9:10 PERFECT! - I love it when a plan comes together. During this 2 miles I remember how much I love a technical run. I'm already on the 3rd set. Wow - this run is flying by. You see, I'm not great at math, so during these runs, much of the time, I am calculating my time. *2nd set - 9:20 and 9:20 = 18:40 not too hard, but now you have to add 19:00 and 18:40 to see where you need to be at 4 miles. This one takes me a while, because I can't keep all of these numbers in my head. Ok, finally get it, 37:40 at 4 miles, I was 37:48. *Now, I have to add the 3rd set on to see where i need to be at mile 6. 37:40 plus 9:10 & 9:10. Ok - 9:10 plus 9:10 is 18:20 add that to 37:40 and you get 56:00, if my math is right. I get to this point at 56:08, I love this, can't believe it... just 2 more miles...I can do this, no problem. *4th 2 miles - 9:00 and 9:00 or under - check my pace several times. It's around 8:44. Thoughts - slow it down....well maybe I should just go with it....no... stick with the plan... you have a race next Sat....stick with the plan...8:52. 1 mile left - 8:53. As I continue with my math, we were at 56:00 and I need to add the last 2 miles on....9:00 plus 9:00 or under, yay, another easy one...18:00 or under. 56:00 plus 18:00 = 74 = 1:14 total, for the progression run. What did I do.....1:13:55! This is why I love a progression run. It goes by super fast. When I'm not calculating, I'm enjoying my tunes, or working on keeping my pace right, but for me, most of the time I'm calculating the next 2 miles because when I get it figured out, then I forget it, and have to calculate again. *Fri. - was a bad tempo run effort -6.5 miles total, but called it a day for the tempo, after 3 miles of a 5 mile tempo run (8:21 for the 3 miles), really need a good run today. *why is it that some days my "ear buds" stay in through the entire run, and other days they are constantly falling out? *I have really missed technical runs. Haven't done much "concentrated running" since Boston training. *Can anyone recommend ideas for me to learn to keep my hips tilted the correct way, correct alignment? I have been working on posture - shoulders back and hips tilted forward, for a long time, but it never seems to become a habit. *progression runs reminds me of yoga and being/running "in the moment"
*hubby surprised me with a Nike vest. Wow! that was exciting... it's kind of rare for him to do that. Sweet! This week - 40.5 miles running, 3 miles walking, a yoga class, 2 days of arm weights, and several days of 10-17 min yoga stretching. This Sat., I will be running the Burn Your Buns 5 mile race on a rolling hills course. It will be HOT, hilly, and HUMID. The good news....I'm pretty sure it will be a PR because I don't think I have ever run a 5 mile race. Julie has a nice giveaway going on - check it out.